"Canada may one day be counted as one of the great horror-film producing countries or it may not, but after forty-five years of malevolent masks, cannibals, creatures, ghosts, diabolists, maniacs and mutations, it cannot be denied that the country has a genuine horror movie history." So states author Caelum Vatnsdal in the closing comments of They Came From Within, which is an excellent overview of Canadian horror films from the 1960s-early 2000s--and a worthy addition to any horror fan's library. It's official! I'm well underway researching and writing my second nonfiction book, titled The Great Fright North. 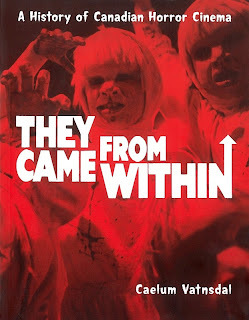 It's a survey of Canadian horror entertainment, in film, television, radio, theatre and comics--and will be published next year. In 1938, British documentary filmmaker John Grierson was tasked by the Government of Canada to study the state of films produced through its Motion Pictures Bureau, which was established in 1918. This department was originally founded to promote Canadian trade and industry, and to centralize all government film production. A year later, the National Film Act was passed--which was influenced by Grierson's report--and led to the establishment of The National Film Board of Canada. Many early productions through the NFB were propaganda films supporting World War II, co-produced by Grierson under the banner Canada Carries On. 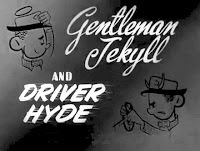 After the war ended, the NFB expanded production and distribution; this included public service shorts, one of which may be considered Canada's first horror film: Gentleman Jekyll and Driver Hyde (1950). Attention fans of Halloween, and all things ghoulish: the 9th annual Scarefest Canada is taking place on Saturday, July 27th in Thornhill, ON. Brought to you by the Canadian Haunters Association, it's a one-of-a-kind show that caters to owners/operators of professional haunted houses, actors, home haunters, artists and halloween enthusiasts in the Canadian haunt industry. Admission is just $10.00, while kids 10 and under are FREE. For more information, visit the official website: Scarefest Canada.